My boyfriend lives in Collierville, and, as much as I used to be a little skeptical about the suburbs, it's actually a really cute town! 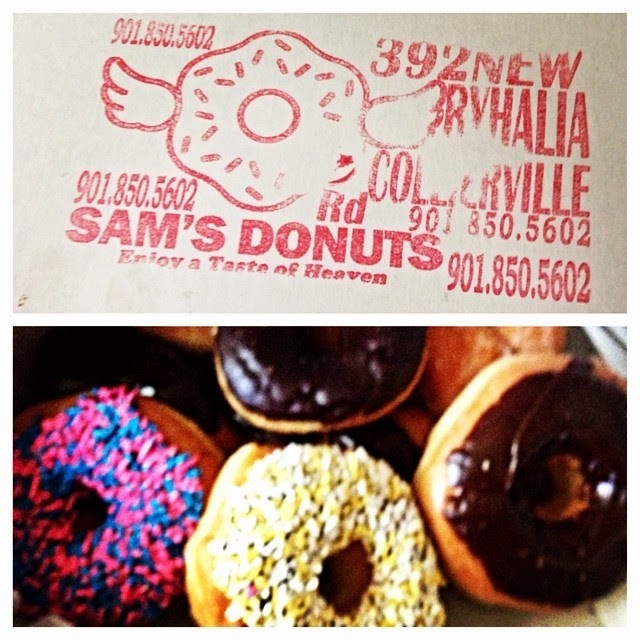 Our semi-regular tradition on his days off is to sleep in, and whoever gets up first goes to Sam's to get a shameful amount of donuts. Sam's is in a small, kind of uninspiring, strip mall on Byhalia, by the Target in Collierville, and it's kind of sparse inside (and it's cash or check only - plan accordingly!). But don't let that fool you - grab a chocolate milk from the case, order an embarrassing amount of donuts (or pretend they're for more than 2 people...), and go home, sit in bed, guard your donuts from your crazy dog, and watch cartoons.